As you are probably aware, frequency is the number of occurrences of a repeating event over time. With music, pitch and rhythm are the key elements. Scientifically these are measured as frequency versus amplitude and beats per minute. Of course, frequencies occur throughout more than just music. Depending on the background of the person with whom you spark the conversation with, science engineer, communications person or musicians, their definition and daily use of the frequency spectrum will slightly differ. An air pilot or radio host might think of it in terms of a wireless communication frequency. A composer and musician will be thinking about pitch and harmony. Similarly, a recording and mix engineer will think how to best to balance the EQ and mix the instruments together. Then you have your aerospace engineers that will go into great detail about each region of the spectrum; ranging from radio waves to infrared waves to gamma radiation. Being an audio company, we’ll obviously be discussing the audible frequency spectrum. Sound is a combination of different frequencies at different decibel levels. They are measured independently. An example would be a tree branch cracking off a tree. Although it is producing sound at all frequencies, the higher crackling sound is more prevalent which means the decibel level of the upper frequencies is boosted. Whereas the initial impact of somebody executing a cannon ball into a swimming pool creates deep frequencies, and the water splattering back into the pool is in the higher frequency range. As found in many studies the typical human hearing range is 20 Hertz (Hz) to 20,000 kilohertz (kHz). You may also know dogs can hear up to 44 kHz and dolphins can hear up to 150 kHz. The ability to hear the lower and higher end of the spectrum first depends on your own ears, then on the operating performance of your speaker. Most tower speakers handle down to the 40 Hz range while bookshelves will have less low-end extension down to around 60 or 70 Hz. Frequencies above 80 Hz are more in-line with a tone or pitch you can sing along to, rather than the rumbling that is felt upon adding a subwoofer to the mix. Lower frequencies take longer to develop and localization of the sound starts to dissolve below 100 Hz. Every instrument or sound effect will cover a broad range of frequencies. Bass most obviously will cover the low end. Vocals will sit mid-range. The cymbals of a drumset will carry the high-end sizzle. Other instruments like piano and acoustic guitar will provide the low-mid warmth. Since most instruments cover a wide range of frequencies, it’s nearly impossible to assign a single frequency to represent an instrument. To familiarize yourself with the frequency spectrum, you can download an app called “Generator” on your smart phone. It will allow you to sweep the frequencies from 20Hz up to 20kHz. Just plug in to your receiver and you can hear each frequency tone. Of course, natural instruments will not sound like these tones because of the extreme range of frequencies vibrating while an instrument is played. The pure frequency tone is not the most pleasing sound… In fact it can be quite obnoxious! So be wary of the volume (especially anything above 500 Hz) before you begin your journey exploring the frequency spectrum. There are all sorts of charts out there that show the different frequency ranges and which instruments create sound in those ranges. Rather than throwing a confusing looking chart on here, it’s probably easier to digest by first looking at the ranges in a numerical format. 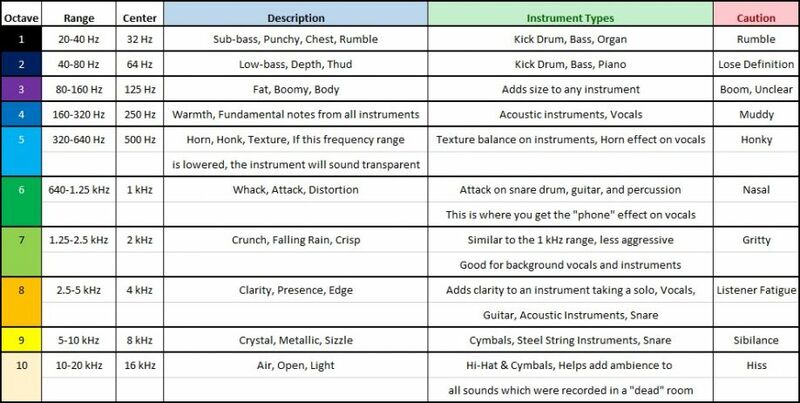 Once that becomes understood and you can easily digest the information, looking at a chart with instruments might make more sense then. Below is a detailed overview of the 10 octaves of the frequency spectrum. It also includes the types of instruments that will play in those ranges along with their center frequency. Also note the cautionary tones that a mix engineer would avoid while mixing a record. These are great to know so that you can better comprehend what you’re listening to, especially while engaged in critical listening. All of these ranges can be adjusted using an equalizer. While calibrating your home theater system or stereo speakers you’ve probably already set a crossover for each speaker and subwoofer. A crossover is technically a form of an equalizer and would fall into the “filter” category. While there are many types of equalizers, each one is meant for a specific purpose. For more detail on equalizers please refer to our blog Using Equalizers and How They Affect Your Speakers. Once you’ve familiarized yourself with the frequency range and each octave and their relative pitch or tone, you’ll be able to make adjustments within your home theater system or car as needed. It’s much more compelling to alter the sound once you’ve had a chance to listen and study up. Always let your ears be the judge. If you feel your system could use slight adjustments or if you feel like having a trial and error session, just go into your receiver’s menu settings and find the EQ. Most likely it has a fixed 10 band EQ (similar to below) adjustment and you can raise or lower a particular frequency range to your liking. And of course, always listen carefully while making adjustments because most likely your tweeter is not going to be happy with a major bump at 2 kHz and above, while your woofer may not like a big boost at 32 Hz.